This year The Good Man and I had the chance to celebrate the Fourth of July with some good friends. There were six of us total (three couples), and we met at our friend’s house for a special treat. One of our crew had just recently returned from a trip to Ethiopia. She and her husband are in process of adopting an adorable baby boy and she had to make a visit to work through the paperwork with the local courts. 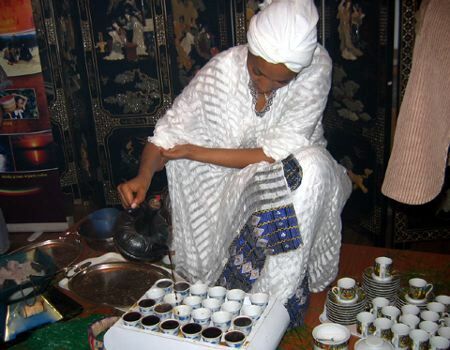 While in country visiting her baby son and patiently working though the long process, she was treated on several occasions to the Ethiopian coffee ceremony. On our Fourth of July holiday, she wanted to share this ceremony with us, her friends. Our friend had hauled home a big bag of green coffee beans, water hulled (the good stuff) not fire hulled, and we sat outside in the beautiful sun while she told us about the ceremony. First, she roasted the beans on the grill. We watched as she shook and swirled the pan, much like a slow Jiffy pop motion. When we all agreed that it looked like the beans were at a good medium roast we all took in a whiff of the fantastic aroma from the pan. We then took turns using a mortar and pestle to smash the beans down to a nice grind. It was satisfying work to smash, smash, smash those crispy beans and release the beautiful scent and oils. The grinds were then put into a French press and once brewed, a round of coffee was poured into six cups. Yuuuummmm! It had a floral aroma and tasted so light and delicious. So amazing with just a touch of sugar and nothing else. In keeping with tradition, we had three rounds of coffee while we discussed our lives, the news of the day, baseball, and got caught up with each other. This is part of the ceremony, the community, the support, the friendship. Now, I love a great cup of coffee, but I rarely drink caffeinated coffee. After three cups I was ready to clean my house top to bottom, jog a thousand miles, and throw a 98mph fastball. But it was a happy caffeinated high. I was honored to be a part of the ceremony and I can hardly wait until our friends bring home their baby boy. I hope to we can continue to give him a sense of community and family…maybe even over a cuppa or two…or three. © 2011, feature, Karen Fayeth, All rights reserve; Wikipedia quote and photograph by Wei Tong.